Battle Type Evolution Requirements Greymon + Winning Percentage: 40%! Garurumon + Winning Percentage: 40%! Stingmon + Winning Percentage: 60%! 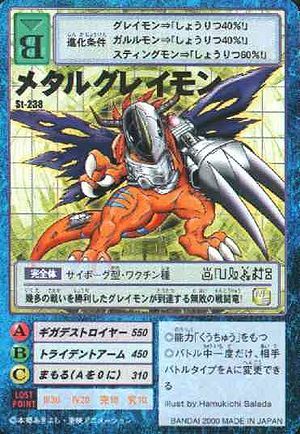 After winning numerous battles, Greymon attained the form of this undefeated battle dragon! ◎Only once during battle, you may change the opponent's battle type to A. This page was last modified on 3 December 2016, at 21:01.